Most snow and water athletes realize that taking a digital camera along while skiing, snowboarding or scuba diving is usually a bad idea. Even cameras designed to go underwater are usually bulky and can impede your activities. Liquid Image has a line of sports cameras that lets you capture every thrilling moment while you’re out owning the slopes or exploring the reef. 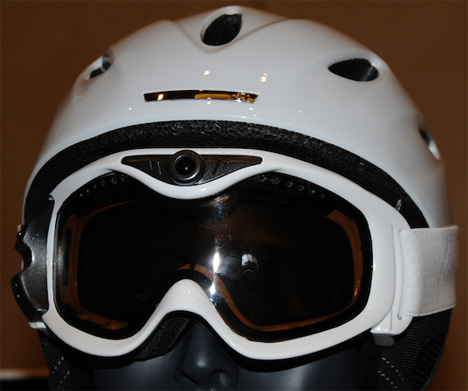 The above model is the Summit Series Snow Camera Goggle, a camera/camcorder that lets you snap pictures or record video while playing in the snow. It has 16GB of built-in memory and you can add another 16GBÂ via the micro-SD card slot. 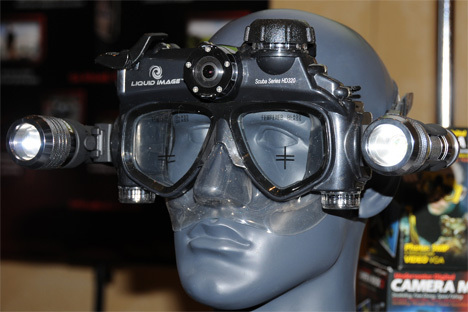 Lights on the inside of the goggles give you info about the camera’s current settings. And for the other half of the year, the Scuba Series HD Wide Angle lets you catch the action in the water. Like the Snow Camera, the Scuba mask gives you 720p video and 5 MP still shots. It’s good up to a depth of 130 ft and lets you capture your underwater adventure in high definition and with a wide field of vision. Of course, you may look so weird that all of the underwater wildlife scram as soon as they see you, but at least you’ll get some high-def shots of them high-tailing it to safety. See more in Camera & Video or under Gadgets. January, 2010.